First came the fence, which splintered the olive trees from Bil’in, the Palestinian village that tended them. Then came the tear gas canister that hit a local, well-liked man named Basem Abu Rahme in the chest, killing him. Everyone knew Basem, which is what everyone called him. 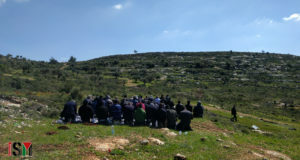 Mohammed Khatib, one of the village’s 1,700 residents, was at that protest, and is still deeply disturbed by the death. Khatib, 35, was in Toronto on the weekend on a national tour to promote the village’s latest bid to seek justice – using Quebec’s courts to stop Israeli settlements. “We want to show that there is no justice in Israel,” said Khatib. The case, filed last year, alleges Green Park International Inc. and Green Mount International Inc. are complicit in war crimes because they helped build an Israeli settlement in the occupied West Bank. The village’s lawyers have based their case on international and domestic Canadian law. Canada’s federal Crimes Against Humanity and War Crimes Act states a population transfer by an occupying power to “territory it occupies” is a serious violation of international humanitarian law. 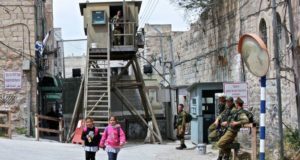 Mark Arnold, the village’s Canadian lawyer, said Levy will argue the case should be tried in Israel and that it should be dismissed on jurisdictional grounds. First, Arnold said, the case deserves to be heard here because the companies are registered in Quebec. For human rights groups and others, using domestic law to prosecute alleged foreign crimes is not new. In May, under the same federal act, a Quebec court found Désiré Munyaneza guilty of war crimes committed during the Rwandan genocide in 1994. Most famously, the American oil corporation Unocal was dragged into a U.S. court in 2005 by Burmese villagers who alleged the company was complicit in human rights violations there. The company settled for an undisclosed amount, generating buzz among human rights groups that domestic laws may help in their struggle against international corporations. In 1998, however, a Quebec court dismissed a class-action suit that sought damages from a Canadian company, Cambior, for a chemical spill in Guyana. The judge said the plaintiffs should instead seek redress in the Guyanese legal system. 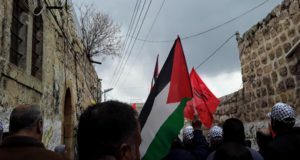 But Emily Schaeffer, an Israeli lawyer representing the village, said they are looking to a recent, more positive precedent involving the corporation Veolia, commissioned to run a rail system between West Jerusalem and East Jerusalem, also considered occupied territory under international law. The dismissal motions begin Monday in Montreal.